Patients with psychosis have accelerated aging of two brain networks important for general cognition—the frontoparietal network (FPN) and cingulo-opercular network (CON)—according to a new study in Biological Psychiatry. Efficiency of the FPN network was normal in early psychosis but reduced in chronic patients, indicating that the decline happens after illness onset. The findings support the idea that intervention to boost these brain networks after early signs of psychosis may help patients have better functional outcomes later in life. In the study, Dr. Sheffield and colleagues used brain imaging to compare the connectivity between brain regions—a measure of how efficiently the regions communicate—in 240 patients with psychotic disorder (including schizophrenia and psychotic bipolar disorder) and 178 healthy controls. “The accelerated decline was specific to cognitive networks, providing evidence that accelerated aging is not due to a global reduction in efficient communication across the whole brain,” said Dr. Sheffield. This graph depicts group differences in network efficiency. 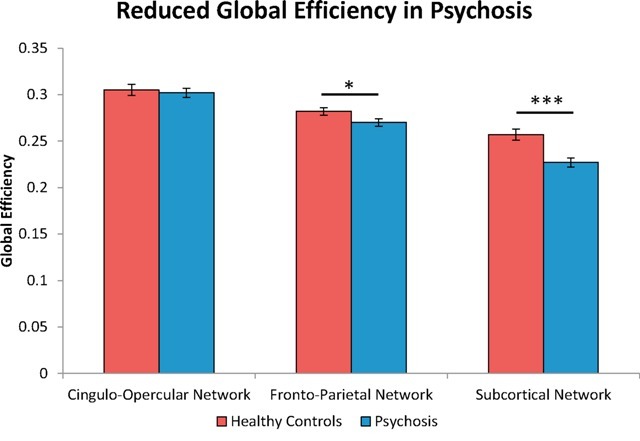 Specifically, patients with psychosis showed significantly reduced global efficiency in the frontoparietal and subcortical networks, in comparison to healthy controls. The article is "Accelerated aging of functional brain networks supporting cognitive function in psychotic disorders," by Julia M. Sheffield, Baxter P. Rogers, Jennifer U. Blackford, Stephan Heckers, and Neil D. Woodward (https://doi.org/10.1016/j.biopsych.2018.12.016). It appears in Biological Psychiatry, published by Elsevier. Copies of this paper are available to credentialed journalists upon request; please contact Rhiannon Bugno at Biol.Psych@sobp.org or +1 214 648 0880. Journalists wishing to interview the authors may contact Julia M. Sheffield, PhD, at julia.sheffield@vumc.org or +1 615 875 9434.